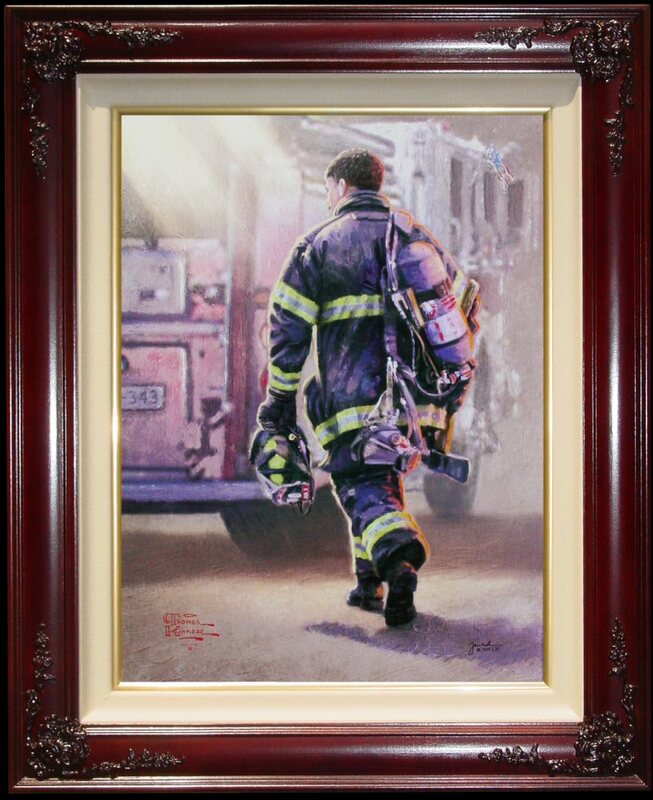 The second release in Thom’s Heading Home series, "Selfless Service" is a commemorative image for 9/11. ++++ Tom created this painting in 2011. ++++ Rare! This Edition is LIMITED to ONLY 911 in the world! ++++ 24" x 18" CANVAS Framed in your choice of approx 32" x 26" Redwood Burl, Antique Gold, or Brandy with fluted roses Museum Quality Frame ~~ ready to hang! 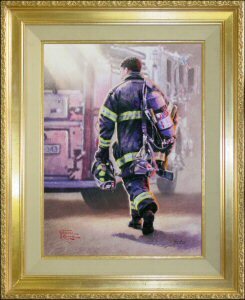 ++++ Brass Plaque with the legend "Selfless Service ~~ Thomas Kinkade"
Signed and Numbered (S/N) Canvas Standard Numbered and Signed & Numbered Canvas Lithograph Limits vary by release. Individually Hand Highlighted with oil paint. The artist's authorized security signature featuring DNA technology. Individually hand numbered. Corresponding Certificate of Authenticity. Before May 1997 the Signed & Numbered and A/P,G/P and P/P were ALL personally hand signed by Thomas Kinkade. "'There is no greater love than to lay down one’s life for one’s friends', a divine truism emblematic of the profound bonds that inextricably link our nation. 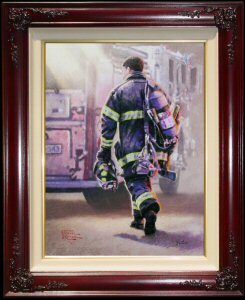 Nowhere has that love been more vividly expressed than in the selfless service of our beloved first responders. 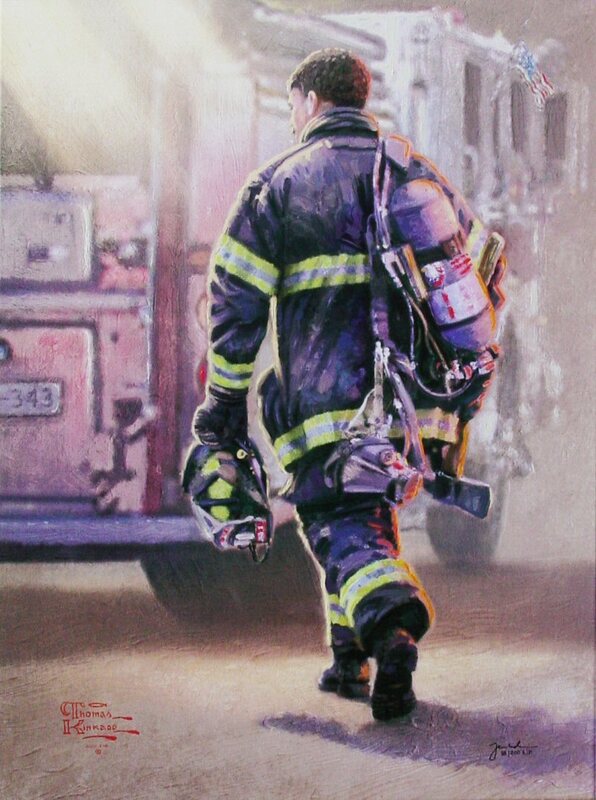 Whether courageously entering the embattled towers on 9-11, picking up an injured teammate in battle, or diligently serving in our law enforcement community, our brave brothers and sisters daily express unconditional love... often with the ultimate Sacrifice"